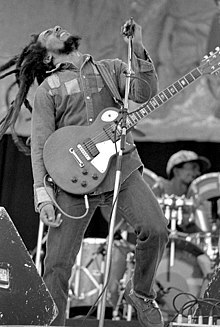 Popular Reggae airtist Bob Marley in 1980. Reggae is a muisic genre that oreeginatit in Jamaica in the late 1960s. The term an aa denotes the modren popular muisic o Jamaica an its diaspora. A 1968 single bi Toots and the Maytals "Do the Reggay" wis the first popular sang tae uise the wird "reggae," effectively namin the genre an introducin it tae a global audience. ↑ "Frederick "Toots" Hibbert Biography". biography.com. Retrieved 2016-07-02. ↑ "reggae". Dictionary.com Unabridged. Random House, Inc. Retrieved 2016-07-10. This page wis last eeditit on 29 August 2017, at 20:02.